We thought we had seen the ultimate street brawling crossover when Street Fighter X Tekken hit the scene. We were wrong. 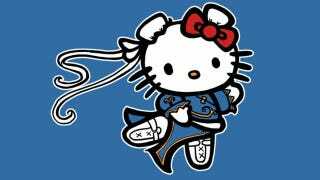 In fall 2012, Street Fighter and Hello Kitty will finally be one, at least from a merchandising perspective. Hello Kitty parent company Sanrio and Capcom are teaming up to mash-up Street Fighter and Japan's favorite feline in a line of co-branded merchandise featuring Kitty and friends dressed up in iconic Street Fighter garb. The announcement was teased yesterday during the Capcom panel at the San Diego Comic-Con yesterday, when an image of Hello Kitty in a Chun-Li outfit briefly flashed on the screen. I've not seen the image, but I assume it looked something like the above picture, the work of artist and illustrator Karen Hallion. While no specific merchandise has been announced, we can probably expect figures, t-shirts, pencil case, and whatever else Sanrio has sitting around its warehouse, waiting for cat heads to be stamped on them. "Capcom has long admired Sanrio and their ability to create memorable and cherished lifestyle brands so it is a distinct pleasure to partner with them for this new cross-over line of merchandise," said Joshua Izzo, Director of Licensing, Capcom Entertainment, Inc. "The combination of Street Fighter and Hello Kitty will offer fans a whole new way to experience our characters." I'll reserve my excitement until there's a video game that lets me punch that little jerk Badtz-Maru right in the face.